Sara Gutiérrez Redondo en Federico Mosquera Martínez zijn voor ons geen onbekende pianisten. Ze traden bij ons al eerder op in de serie: ‘Laat u verrassen door aanstaande professionals’. Maar het zijn allang geen conservatoriumstudenten meer. We waren er dan ook trots op dit geweldige pianoduo weer te mogen ontvangen! Uiteraard stelden we in onze mooie showroom de mooiste vleugels voor hun op en hebben wij kunnen genieten van adembenemende uitvoeringen van o.a. F. Poulenc, J. Brahms en A. Dvorak. The Piano Duo Gutiérrez-Mosquera is comprised of Federico Mosquera (A Coruña) and Sara Gutiérrez (Valladolid). In spite of their recent creation the Duo has already shown great artistic mastery. They have performed at major festivals, such as Chamber Music Festival in Den Haag (2013), Gergiev Festival 2013, Piano Duo Festival in Amsterdam (2014), and at many of the most important halls of The Netherlands: Grote zaal and Jurriaanse zaal of De Doelen (Rotterdam), Schönbergzaal (Den Haag), Bethaniënklooster (Amsterdam), Waalse Kerk (Breda) and other halls in Rotterdam, Den Haag, Tilburg and Gouda. They have also performed in A Coruña, Spain, at MAC Museum and at the main hall of the University of A Coruña. The Duo was raised in the frame of the prestigious conservatory of Rotterdam, Codarts-University for the Arts. 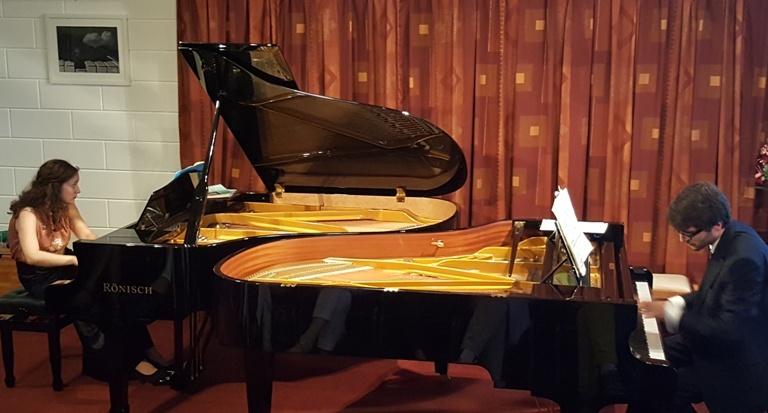 They have received lessons and advices from such important musicians as Matti Raekallio, Bart van de Roer, Jan Dobrzelewski, Jean Bernard Pommier, Stephane de May and piano duo Scholtes&Janssens. They have performed the Concerto for two pianos by F. Poulenc with Codarts Symphony Orchestra under the baton of Hans Leenders in the Grote zaal of De Doelen – Rotterdam achieving a big success. Sara Gutiérrez Redondo studied piano in the Conservatory of her hometown, Valladolid, and she obtained the Bachelor Degree in 2009 at “Centro Superior de Música del País Vasco – Musikene”, in the class of Marta Zabaleta and Miguel Borges, specialising in chamber music with Josep Colom. In June 2013 she obtained the Master Diploma with higher grades under the guidance of Stephane de May in Codarts – Hogeschool voor de kunsten. Afterwards she continued developing her career working with Professor Matti Raekallio in Hannover (Germany). She has been awarded with several prizes in Piano and Chamber Music competitions. She has also received the support of the Fundación Municipal de Cultura of Valladolid, the program “Excellent Youth” of Caja de Burgos and the Govern of The Netherlands. Sara has performed at many important venues and festivals in Spain, The Netherlands, Belgium, Switzerland, Austria, France, Portugal and Czech Republic. Her solo debut took place with Codarts Orchestra under the baton of Hans Leenders in De Doelen – Rotterdam and Middelburg. She has also performed B. Bartok’s Concerto for piano and orchestra n.1 with JOUVA orchestra under the baton of Francisco Lara in Valladolid. She currently combines her concert activity with teaching in Rotterdam. Federico Mosquera Martínez began his musical studies at the age of nine. In 2010 he finished the bachelor in piano with the highest grades at the Superior Conservatory of his hometown. He was studying at the Akademia Muzyczna of Krakow (Poland) with Andrzej Pikul, in the frame of the Erasmus program. Moreover he had been studying piano with Mercedes Goicoa from 2000 and composition with Anton Garcia Abril between 2005 and 2011. He finished the Master Degree in piano at Codarts University of the Arts (Rotterdam) in June 2013, under the direction of Jean-Bernard Pommier and Jose Nuñez Ares, with a scholarship from the foundation Pedro Barrié de la Maza. He has performed in concert halls such as Eutherpe hall (León, Spain), Casa da Música (Porto, Portugal), Zeeuwse Concerzaal (Middelburg) and Jurriaanse zaal of De Doelen (Rotterdam), among others, and participated in major festivals. As a composer, we can highlight the premiere of his Concertino for String Orchestra (2010) with Galician Royal Philharmonic Orchestra conducted by Maximino Zumalave, Three Symphonic Movements (2012) premiered by the Galician Symphonic Orchestra conducted by Victor Pablo Pérez, and the Concerto for Bass Clarinet (2013) premiered by the young clarinetist Igor Urruchi.